FLINT TWP. — Carman-Ainsworth will take two millage requests to the voters May 7, one to increase the millage collected for the district’s sinking fund and the other a measure an override of the Headlee Amendment. 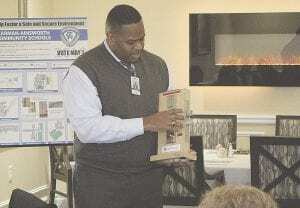 Superintendent Eddie Kindle and Assistant Superintendent Russ Parks took the district’s case to the West Flint Business Association, March 21, where they explained what would be on the ballot and why. The two issues on the ballot will be a 1-mill increase in the district’s sinking fund, potentially generating $750,000 a year from 2019 to 2023; and a Headlee Amendment override not to exceed 2.1314 mills that will generate $45,000 a year for the same period. Kindle explained security concerns are the reason for the need for a sinking fund increase, citing the district’s plans to install more than 300 quick action locks on classrooms throughout Carman-Ainsworth’s school buildings. In addition to locking the doors, Kindle said policy requires classrooms to barricade in place, which means moving furniture against doors. However, he said, the application of this strategy is not universal because of the locking system in the district’s buildings. Officials have researched how to get a universal locking system just to provide an enhancement to the door itself. Kindle said they found the company Guardian SSI has come up with a quick action lock. Most important aspect of a quick action lock, he said, is anyone can execute the lock, which is as simple as pressing a red button. This would provide we an additional lock for each door with a deadbolt. Furthermore, Kindle said if they have to evacuate, opening the door is as quick as reacting the door handle. Potential projects due to an increase in the sinking fund also include repairs to deteriorating parking lots and installation of more effective and efficient exterior lighting. Voters approved the current 18-mill operating millage and 0.5-mill sinking fund in 2004 and renewed them in 2013. However, since 2004, officials said revenue has decreased by nearly 30 percent; that means the district receives $141,000 less today than it did in 2004. Currently the district levies a ½ mill for the sinking fund, generating $350,000- 400,000 annually. If approved, the one mill increase would take a home valued at $150,000, with a taxable value of $75,000, and would assess the owner an additional $75 a year, or 21 cents per day, said Kindle. “I go back to the term investment again, that’s why we are asking for that increase to our sinking fund millage,” he said. Past projects the district has used its sinking fund for includes boilers, roofs and resurfacing the gymnasium. Parks said voters the current 18-mill operating millage, but the district currently does not receive the full amount because the millage was reduced when annual growth on existing property was greater than the rate of inflation, due to the Headlee Override Proposition. A Headlee override is a vote to return the millage to the 18 mills originally authorized by the community. Restoring the levy to the full 18 mills could generate an additional $45,000 a year, Parks said. When Michigan voters approve Proposal A in 1994, it established a statutory rate of 18 mills for non-homestead, that goes directly to the schools. This is assessed only on businesses, rental properties and vacation homes. Parks said in 2018, the district had a Headlee Override – which happens when taxable values go up over the rate of inflation. The override is a rollback on the rate of inflation. This rollback caused the reduction in the 18 mills, thus creating a $45,000 loss in revenue. With the May 7 election, the district is proposing the millage be set at 20 mills – which gives it the rolled back amount of 17.8686 mills, plus 2.1314 mills to equal 20 mills. This way, when a rollback happens it comes off the 20 mills, then Proposal A sets the millage at the 18 mill cap — making it so Carman- Ainsworth schools keeps the $45,000 annually it would lose due to the Headlee Amendment. Parks said by asking to go above 18 mills, the district won’t have to keep going back to the people for a vote to override the Headless Amendment, to ask for a vote. “Hopefully that’s going to last us 10 years,” said Parks, referring the increase.